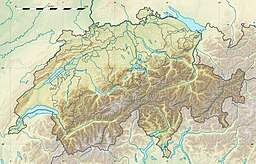 The Eggishorn is a mountain of the Bernese Alps, located north of Fiesch in the Swiss canton of Valais. A cable car station is located on a secondary summit named Fiescherhorli (2,893 m), 500 metres south of the main peak. The Eggishorn lies within the Jungfrau-Aletsch-Bietschhorn region, which has been designated by UNESCO as a World Heritage Site. On its northern flank is the Aletsch Glacier. From the summit the view extends also to the Lepontine and Pennine Alps (Dom, Matterhorn, Weisshorn). ^ Retrieved from the Swisstopo topographic maps. The key col is located east of the Märjelensee at 2,364 metres. Wikimedia Commons has media related to Eggishorn. This page was last edited on 17 April 2017, at 08:22 (UTC).